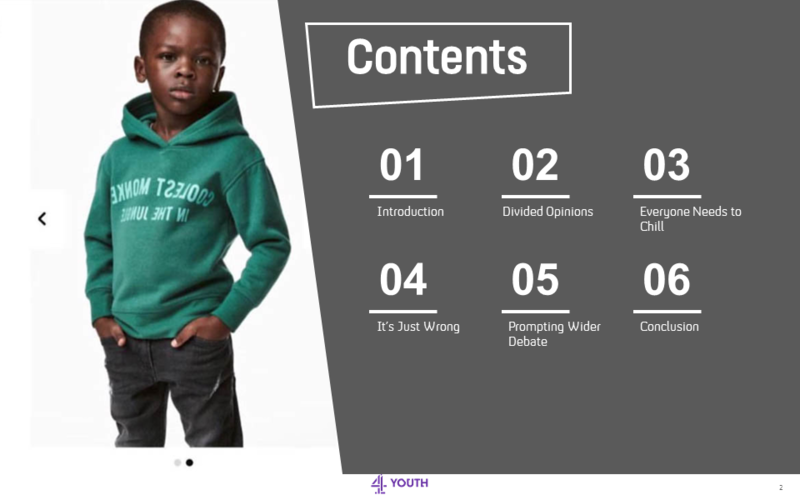 In early January this year, an H&M advert caused huge controversy when a photograph was released of a young black child wearing a green hoodie with the phrase “Coolest monkey in the jungle” emblazoned upon it. In the ensuing public outcry many people took to social media to proclaim their outrage for what was seen as racist advertising. Other critics argued that the deeply inappropriate photograph represented severe negligence of H&M, mainly the advertising team and the board. 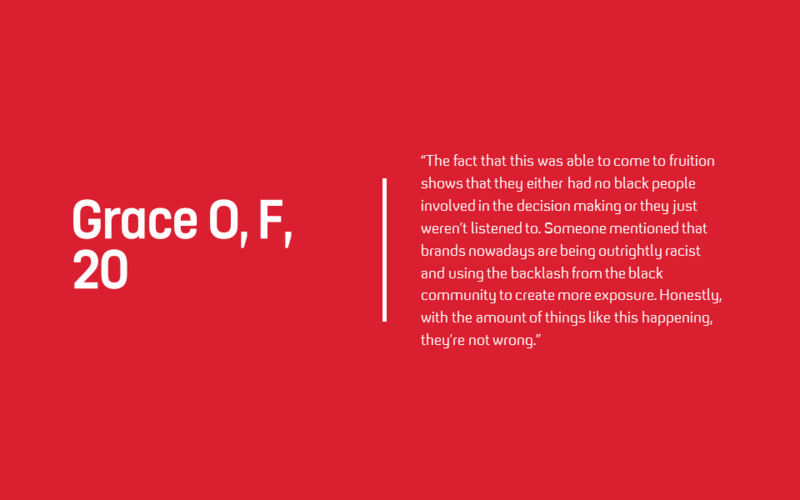 However, others have contrarily responded that it was just an unfortunate and unintentional mistake, and the subsequent backlash is an overreaction that is highly unnecessary and damaging in nature. 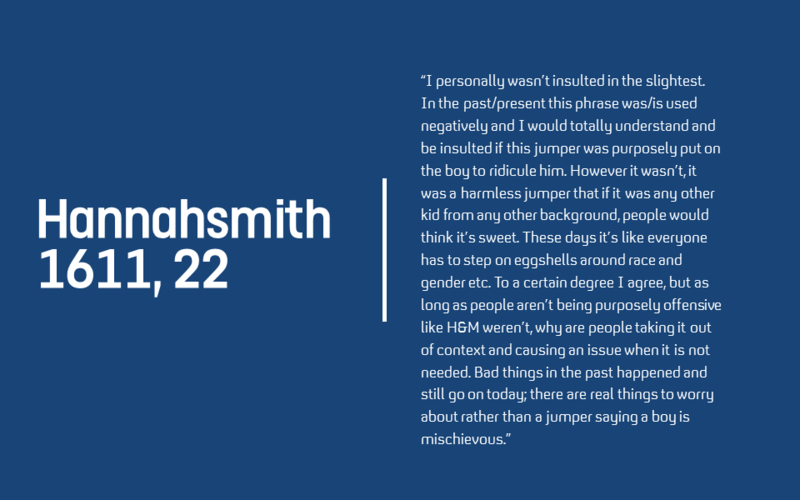 In a qualitative study, we asked 53 of our Tribes how they felt about this recent advertising blunder by H&M, receiving many varied responses. It was recognised by the Tribes that their personal opinions were a result of their own life experiences, backgrounds and ethnicities. Therefore highlighting one reason behind the considerable variation and spread of responses. 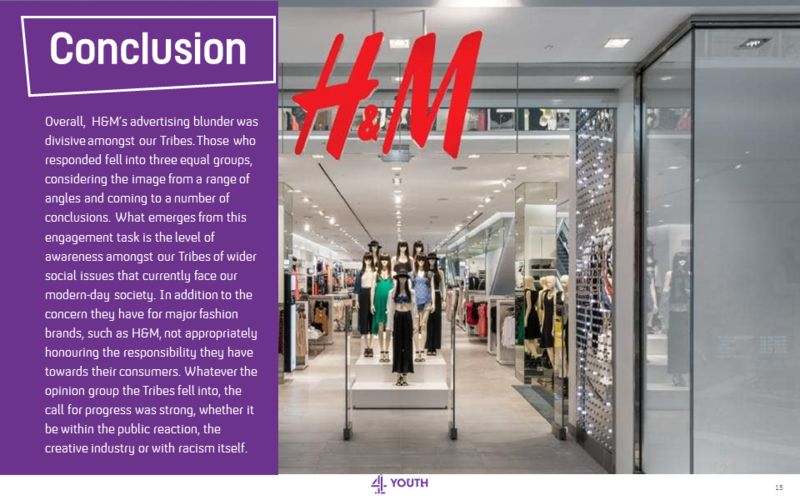 The opinions of our Tribes ranged from finding the advert severely offensive and inappropriate, to critiquing the overreaction of an overly sensitised society, to even claiming that the whole controversy was engineered by H&M itself to generate publicity and drive sales. 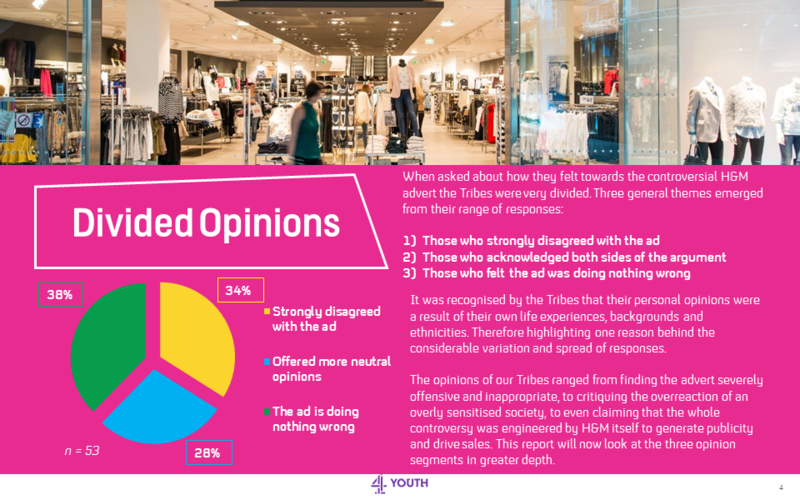 This report will now look at the three opinion segments in greater depth. The majority of the 38% of Tribes who argued that the H&M advert had done nothing wrong, did so the basis that if the child and his mother didn’t care about it then neither should they. This group frequently commented that the photograph was made into a bigger issue than was necessary, pinpointing the media in particular as being overdramatic and fuelling a larger public overreaction. Many also agreed that the wider contextual backdrop of today’s society has been a critical factor in shaping such reactions. Particularly, a common obsession with finding tiny faults, being overly sensitive and stepping on eggshells around issues such as race and gender. Additionally, these Tribes noted that they didn’t believe H&M intended to cause any offense and merely made a big mistake. For this reason, due to a clear lack of motive to deliberately harm, they couldn’t see a problem with the photograph and just brushed it aside as an unfortunate occurrence for H&M. 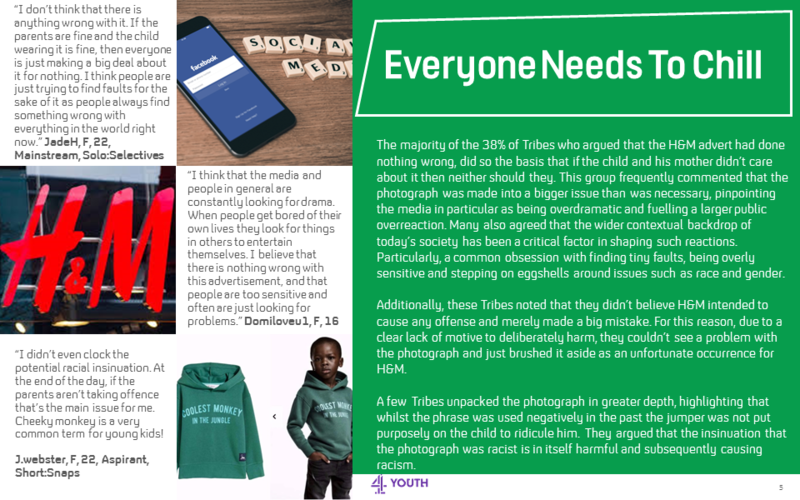 A few Tribes unpacked the photograph in greater depth, highlighting that whilst the phrase was used negatively in the past the jumper was not put purposely on the child to ridicule him. 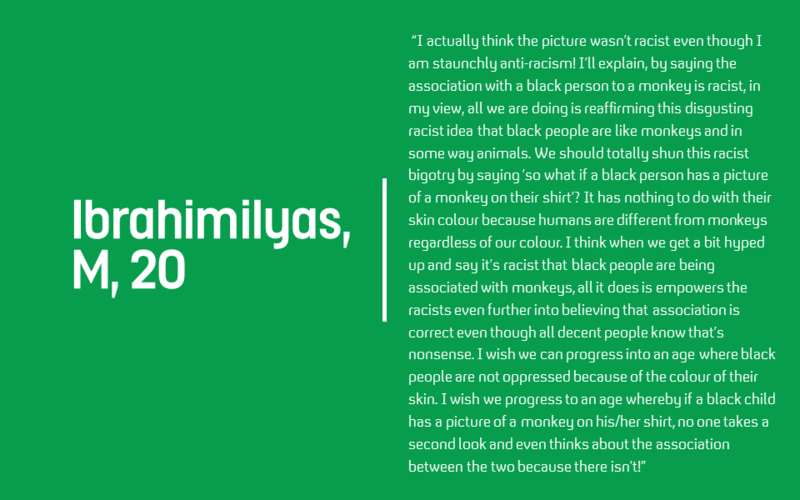 They argued that the insinuation that the photograph was racist is in itself harmful and subsequently causing racism. “I didn’t even clock the potential racial insinuation. At the end of the day, if the parents aren’t taking offence that’s the main issue for me. Cheeky monkey is a very common term for young kids! 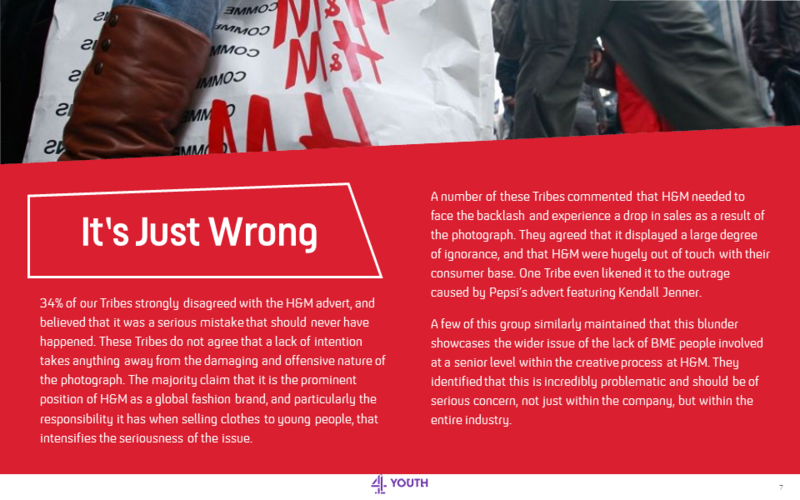 34% of our Tribes strongly disagreed with the H&M advert, and believed that it was a serious mistake that should never have happened. These Tribes do not agree that a lack of intention takes anything away from the damaging and offensive nature of the photograph. 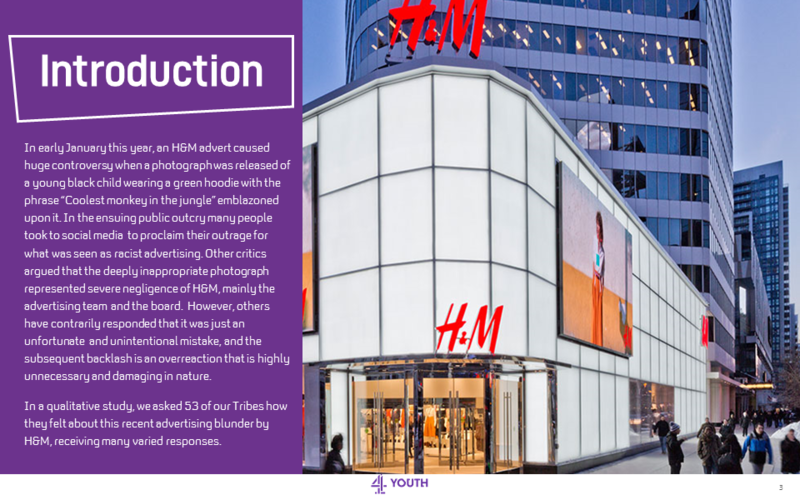 The majority claim that it is the prominent position of H&M as a global fashion brand, and particularly the responsibility it has when selling clothes to young people, that intensifies the seriousness of the issue. A number of these Tribes commented that H&M needed to face the backlash and experience a drop in sales as a result of the photograph. They agreed that it displayed a large degree of ignorance, and that H&M were hugely out of touch with their consumer base. One Tribe even likened it to the outrage caused by Pepsi’s advert featuring Kendall Jenner. 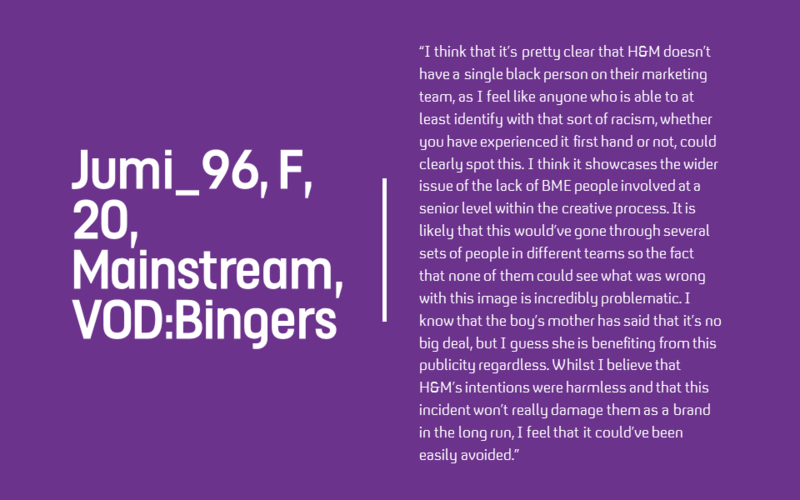 A few of this group similarly maintained that this blunder showcases the wider issue of the lack of BME people involved at a senior level within the creative process at H&M. 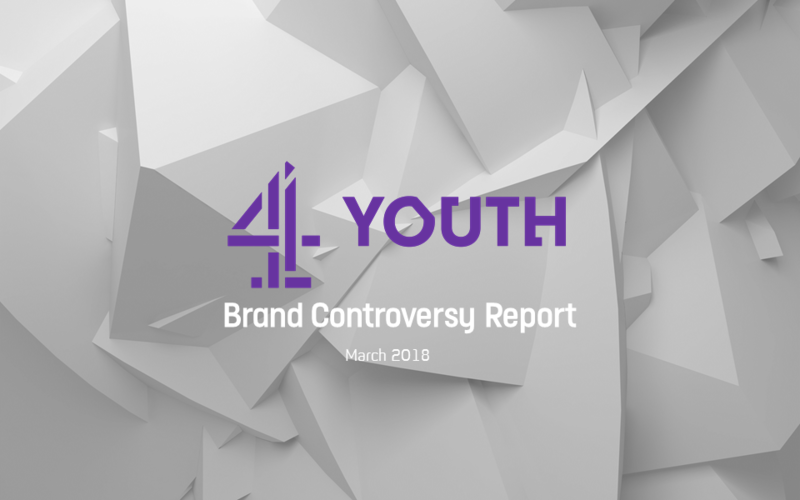 They identified that this is incredibly problematic and should be of serious concern, not just within the company, but within the entire industry. 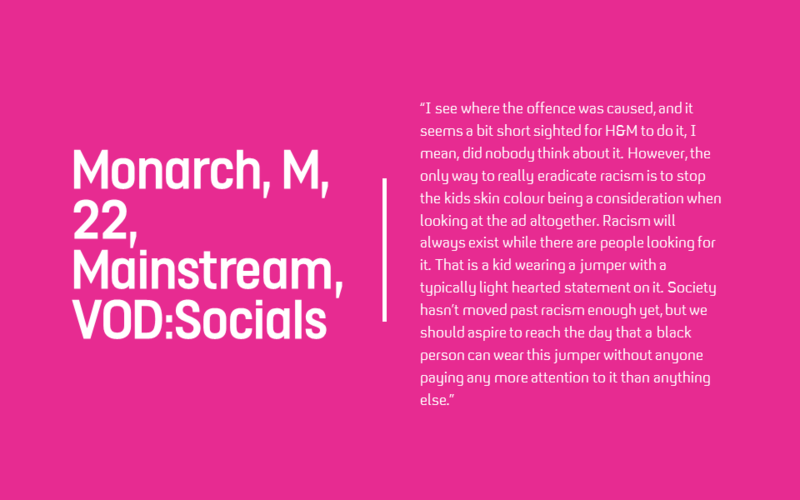 28% of the Tribes acknowledged both sides of the debate surrounding H&M’s controversial photograph, weighing up the different reactions that had been prompted. A large proportion of this group agreed that the photograph represented a disappointing oversight and lack of due diligence from H&M. However, people had to be careful not to overreact as the photograph was not intentionally racist or malicious, so therefore wasn’t as serious an issue. Of this group, all the Tribes understood why offence had been taken and commented that such a lack in cultural sensitivity and awareness by a major brand is worrying in today’s society. 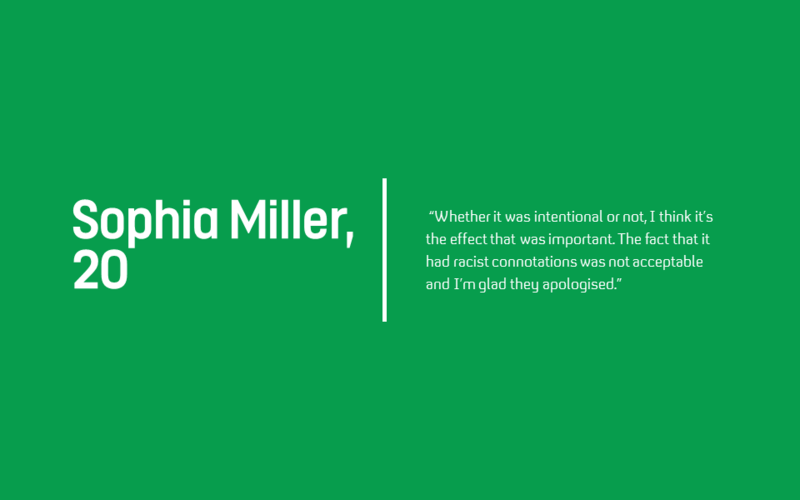 Yet they balanced their critique by countering that it was the over-dramatisation of the issue in the media, and its association with racism, that is in fact more detrimental than the image itself. Overall, H&M’s advertising blunder was divisive amongst our Tribes. Those who responded fell into three equal groups, considering the image from a range of angles and coming to a number of conclusions. What emerges from this engagement task is the level of awareness amongst our Tribes of wider social issues that currently face our modern-day society. In addition to the concern they have for major fashion brands, such as H&M, not appropriately honouring the responsibility they have towards their consumers. 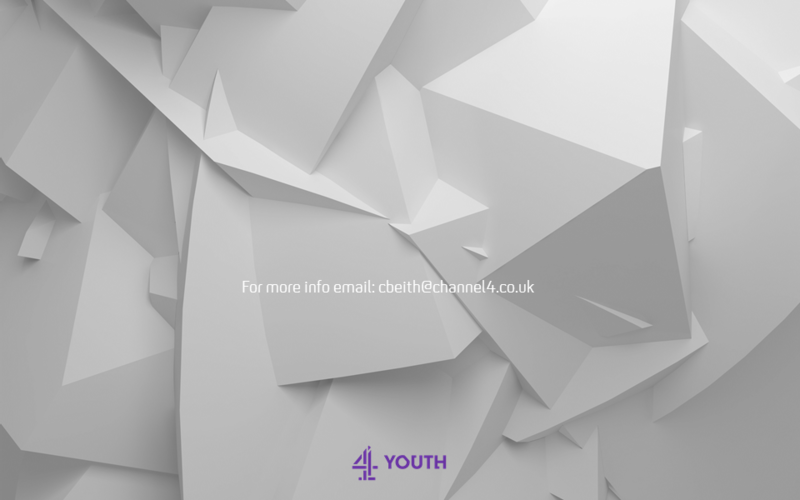 Whatever the opinion group the Tribes fell into, the call for progress was strong, whether it be within the public reaction, the creative industry or with racism itself.